Magic Circle member Johnny Oxford makes your dinner, celebration or promotion unforgettable. Johnny Oxford has a degree from St John's College, Oxford University and has trained in performance in London. He is very proud to be an Associate of The Inner Magic Circle with Silver Star and a Member of the Council of The Magic Circle. "Johnny did a terrific job for me on an evening team building event. Johnny wowed the clients with his excellent skills and his vibrant, fun personality. I would highly recommend Johnny for your event. He is reliable, delivers a great service and most importanly provides a memorable experience for your clients." Maybe you hire magicians a lot, maybe you have never hired a magician before. Maybe you are looking for a magician to add something extra to your intimate dinner party? Maybe you want a trade show magician to draw people to your trade show stand? Or maybe you have a large event to organise? London magician Johnny Oxford is hugely flexible: he is equally at home providing intimate magical entertainment for small numbers of guests at private dinner parties as being a trade show magician at London Olympia using close-up magic and humour to draw people to an exhibition stand and link them up with the sales team. Johnny Oxford's speciality is as a London comedy magician. He has spent hours rehearsing his magic and even more hours listening to Radio 4 comedy and watching Live at the Apollo! Not only will you be amazed, you will laugh. A lot. Johnny offers you the option to combine close up magic with a 'stage' slot comprising magical escapolpogy and/ or dangerous juggling! 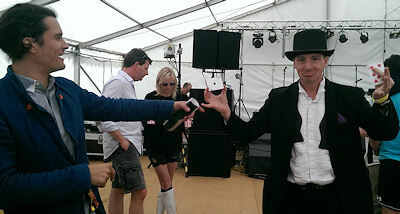 London magician Johnny Oxford works as an adult magician but he can also adopt his alternative persona Juggling John to work as a London children's magician and children's entertainer.